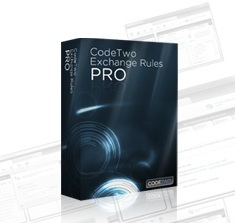 We have recently released an update to CodeTwo Exchange Rules PRO, a Microsoft Exchange Server add-on that aids server administration in fields like automatic email content control, message flow and email branding. The current version, 1.4.5, includes one improvement and 3 minor fixes to bugs, that users have reported to us over the past few weeks. Thank you for your emails and phone calls! We recommend that all users download the newest installer and re-install the program on their servers. The update is free for all license owners. The new version needs to be downloaded from our website and installed on top of the previous version. All previous settings and licensing info will stay unchanged. Should you have any questions, feel free to contact CodeTwo Support from Monday through Friday, 24 hours a day (check opening hours here).